Rose Gold Tourmaline and Diamond Dress Ring — Form Bespoke Jewellers Ltd.
A beautifully bespoke rose gold tourmaline and diamond dress ring. The customer came to us looking to remodel a dress ring which they already owned. Using our CAD (Computer Aided Design) software, our expert Yorkshire jewellers were able to ensure that their intricate basket detail and beautiful halo design truly came to life. 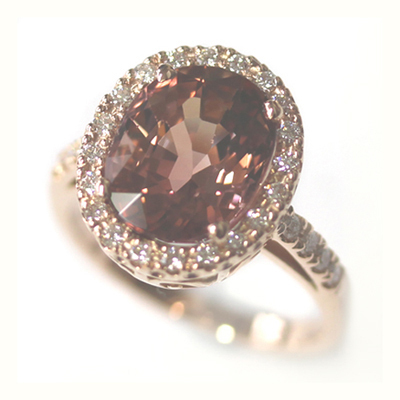 At the heart of the design is smoky peach, oval cut tourmaline held in place by four, neat, rose gold claws. Surrounding this is a sparkling halo of round brilliant cut diamonds. The whole halo sits in an elegantly designed swirling basket held by diamond set shoulders. The customer was thrilled with their bespoke dress ring.